In 1867 work began in north London on the fourth Blackfriars (as the Dominicans and their priories came to be called in England) in London. The Dominicans had first arrived in 1221 and, after an interruption, returned to the city in 1861. The new church was built on an ambitious scale, cathedral-like in stature, and it was to have altars in individual chapels dedicated to each of the fifteen Mysteries of the traditional Dominican Rosary. 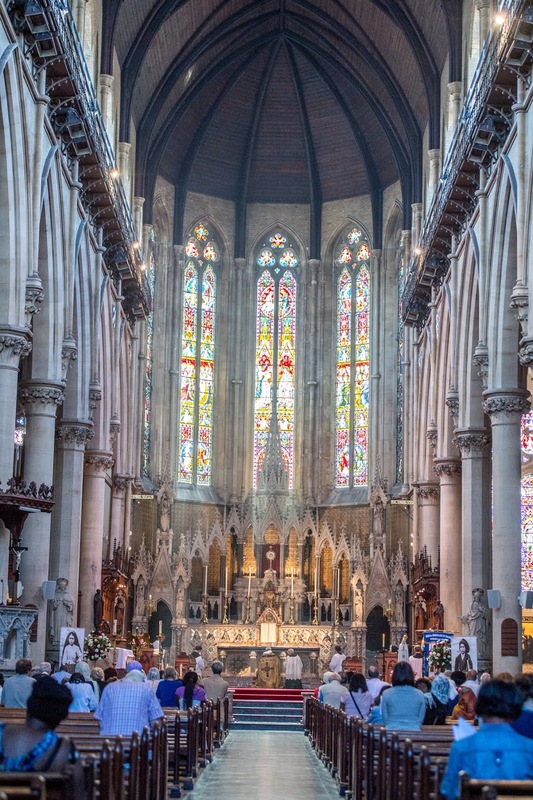 When the church was completed in 1883, it would be the first in the world to have distinct Rosary chapels, and the church was dedicated to Our Lady of the Rosary and Saint Dominic. 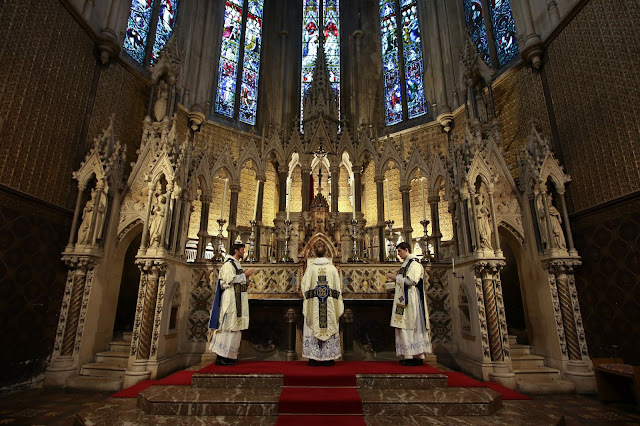 The High Altar itself, with an 'Exposition Throne' for solemn exposition of the Blessed Sacrament, was dedicated to the fifth Glorious Mystery, commemorated in the apsidal stained glass windows around the High Altar. 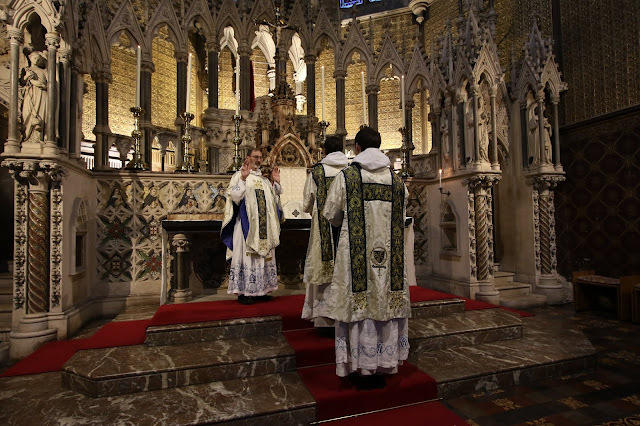 The original dream of Cardinal Wiseman, who had invited the Dominicans back to London, was for the city of London to be surrounded by a Shrine church on top of each of the hills that ringed the city so as to surround the city with prayer. 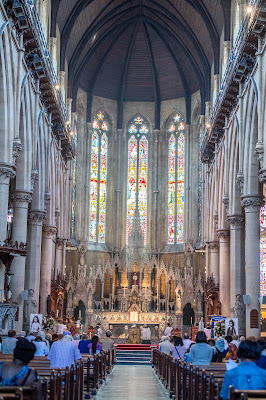 The Dominican priory church with its fifteen Rosary chapels (and a further four Altars dedicated to various Dominican saints) was to have been the Shrine of Our Lady of the Rosary. This dream came into fruition in October 2016 when Cardinal Nichols designated the church as the Rosary Shrine for the Archdiocese of Westminster (London), the first and only such Shrine in the United Kingdom. Last year, to mark the 150th anniversary of the establishment of this fourth Blackfriars in London, the Dominican friars at the Rosary Shrine commissioned a set of High Mass vestments. 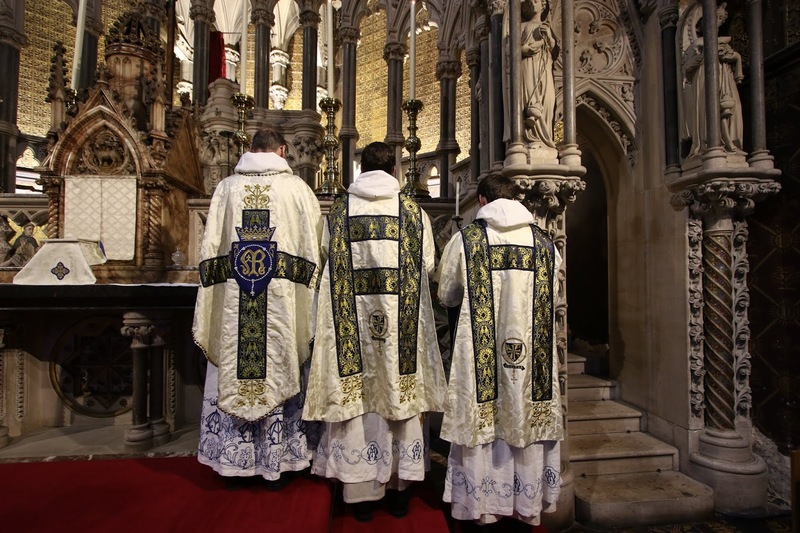 The creation of these vestments was entrusted to Geneviève Gomi of 'Maris Stella Vestments' who once again collaborated with me in the design of the vestment set. 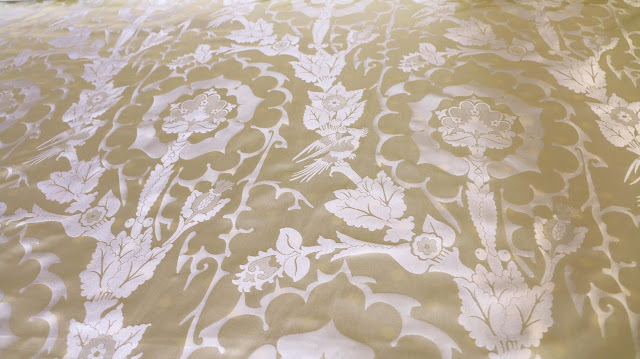 The main fabric for the set was an ivory silk with the damask pattern called 'Comper Jay'. Designed by Sir Ninian Comper in the 1890s, it was specially woven by M. Perkins & Son; this fabric design has not been in production for several decades. The pattern itself seems to be inspired by a silk panel from Iran dating to 1600-1700 and housed in the Victoria and Albert Museum in London. The orphreys were cut from a silk textile based on a pattern in a 14th-century Florentine painting of the Coronation of the Virgin by Jacopo di Cione, now housed in the National Gallery in London. The motif of 'love birds' matches the floor tiles in the chapel of Our Lady of the Rosary in the Rosary Shrine church. 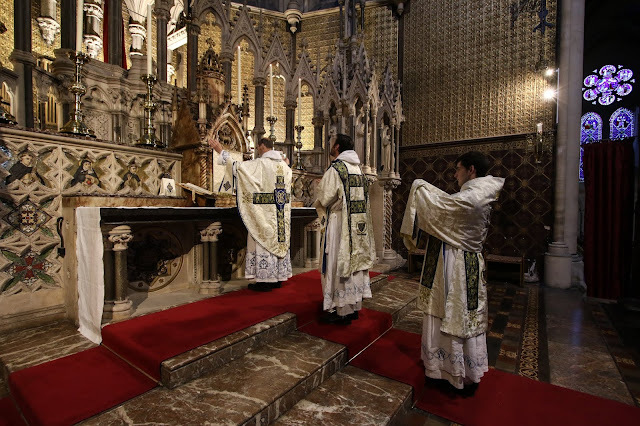 The embroidered embellishments (finials on the cross, and crosses on the burse and chalice veil) in the vestment set were similarly inspired by the floor tiles and mosaics around the High Altar of the Rosary Shrine church. Two heraldic emblems feature prominently in this set: the crowned monogram of Our Lady surrounded with a pearl Rosary – this being the coat of arms of the Rosary Shrine – and the Dominican coat of arms surrounded by an amber Rosary. Finally, the edge of the chasuble is trimmed with a Rosary comprising of pressed glass beads, entirely hand-sewn to the chasuble. As Geneviève sewed these beads she prayed the Rosary, thus imbuing her work with prayer and devotion. The chasuble was first worn by the Papal Nuncio, Archbishop Edward Joseph Adams, on the feast of Our Lady of Guadalupe (12 December) in 2017. 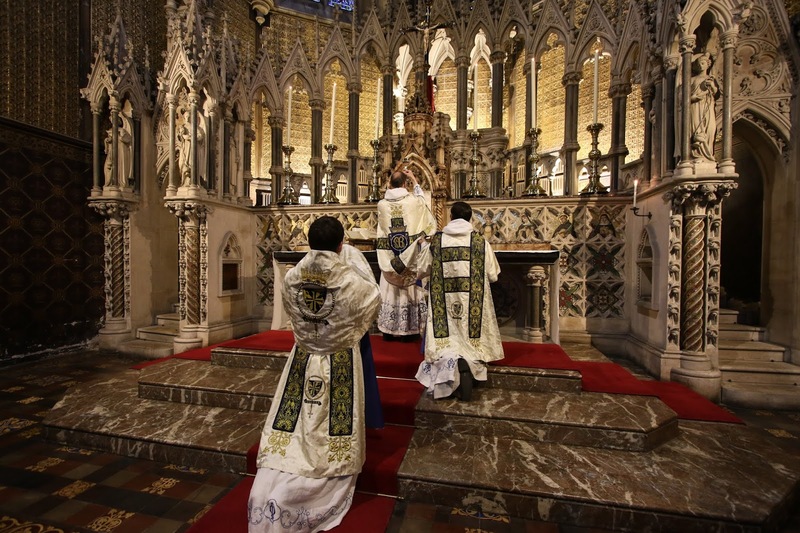 On that occasion he also blessed a relic image of Our Lady of Guadalupe, specially flown into London from the Basilica in Mexico City and installed permanently in the Rosary Shrine. A Latin inscription embroidered inside the chasuble states that the vestment was made in thanksgiving for 150 years of Dominican presence, and that it was inaugurated on the feast of Our Lady of Guadalupe, and it asks the wearer of the chasuble to pray for the benefactor of the vestment set. The reader of this article is likewise asked to pray for the donor of this fine set of vestments which honour Our Lady of the Rosary. Photo credits: All photographs by Fr Lawrence Lew OP, except 'Exposition on the Throne' by John Aron, and 'Comper Jay' by Geneviève Gomi.